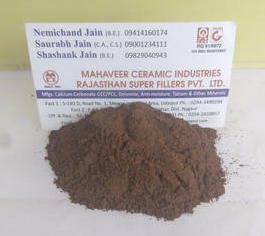 Red Oxide Powder - Mahaveer Mineral from India. A leading manufacturer of Red Oxide Powder We have set new benchmarks in the industry with our high quality products and commitment to customer satisfaction. Our highly reliable and most efficient employee resource has made us emerge as the most preferred organisation in the industry. The Red Oxide Powder can be customized by us as per the special demands of the clients. Our Red Oxide Powder is offered in sealed-tight packing and at the most competitive prices. Red Oxide powder is most widely occuring in nature. It is the basic mineral for steel plant. Red Oxide has tremendous application in building, construction, paint and many other industries. Red Oxide is known for its corrossion protection, inertness to alkali and chemicals. Durability of paint made with Red Oxide is very well known. Providing you the best range of Red Oxide Powder with effective & timely delivery. Red oxide powder is used by many industries. It is an inorganic compound which is available in India in great abundance at different regions. It is one of the most important mineral that is used in steel plant. This article talks about some of the very popular uses of Red Oxide along with its properties which are highly supportive in making it so beneficial for different industries. Let us have a look at these different applications. Due to all these attributes our product Synthetic Iron Oxide have a wide application in Paints, Coatings (Decorative, Protective & Surface Coating), Colorants, Synthetic Enamels, Porcelain Enamels, Primers, Wood Primers, Dry Distemper, Cement Paints, Adhesives, Cement Flooring, Vinyl Flooring, Designer Tiles, Paving blocks. Concrete application. Construction, Cement Colors , Mosaic Tiles, Ceramics, Plastics (Plastics Asphalt), pvc, Rubber products ,Paper, Crayons, Leather, Glazes, Dadoes, Plaster works. Elastomers, Textile, Inks, Fiber, Glass Polishing, Metal Polishing, Rouge Polishing, Optical Lens, linoleum etc.